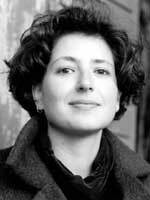 Prize-winning poet Kapka Kassabova was born in Sofia, Bulgaria, in 1973. She lived there until she was 17 when her family migrated to England. Two years later, in July 1992, Kapka arrived in New Zealand and was for some years based in Dunedin where she studied at the University of Otago. She graduated in 1996 with a BA (Hons) in French and moved to Wellington while she completed a Masters degree in creative writing at Victoria University of Wellington. In 1998 she taught English in Marseille, France for part of the year. After she returned to New Zealand she took up a Buddle Finlay Sargeson fellowship, based in Auckland (1999). Kapka has been writing poems since she was 8 years old. While she was a high school student in Sofia, Kapka was a member of the young writers’ club and had work published in the leading literary journal Mother Tongue. She began writing in her fourth language, English, when she was 19. She now writes only in English although she has said that learning English was a painful experience (she is partly self-taught – through listening to Beatles’ records) and it took two or three years before she felt confident about writing poetry in English. She is a prolific writer with two published collections of poems, two novels and much journalism to her credit. She also appears on the first New Zealand CD poetry anthology, Seeing Voices. Kapka is also a reviewer and critic having been, amongst other things, the poetry and prose sub-editor of Critic and an occasional reviewer for the NZ Listener. Her first book, All Roads Lead to the Sea (AUP, 1997), was published to great critical acclaim (and sold extremely well, having to be reprinted less than a year after publication). It was a finalist in the Poetry Section of the 1998 Montana New Zealand Book Awards and won the New Zealand Society of Authors’ Jessie McKay Award for the First Best Book of Poetry. We were tired, we were not in the mood. We had been there. It wasn’t what we wanted. We were the constant witnesses of ourselves. enormous and yellow beyond itself. We drove towards it in the falling night. The faster we drove, the bigger it became. We knew it was a rare chance. pierced by the headlights of passing cars above. and all its alien lights. We had come from that city. You had a camera on a tripod by the edge of the water. I sat inside the vintage car. The moon bulged right above us. We had everything that night. So we took a photograph and drove away.